What size of cable should I use with my inverter and battery? It is very important to be sure you are using the appropriate cable size for your inverter/battery. Failing to do so could lead to your inverter not supporting full loads and overheating, which is a potential fire hazard. Use this as a guide for choosing the proper cable size, and be sure to contact a professional electrician or our tech team with any additional questions you may have. 1.What size inverter do you have? 2. What is the DC voltage of your battery bank? 3. Now divide the inverter’s wattage by your battery voltage; this will give you the maximum current for your cables. 4. So, in our example 208.33 amps is the maximum current that the cable needs to support in order to properly provide the current to the inverter. Use the below chart as a guide to determine which size cable will be best for your application. 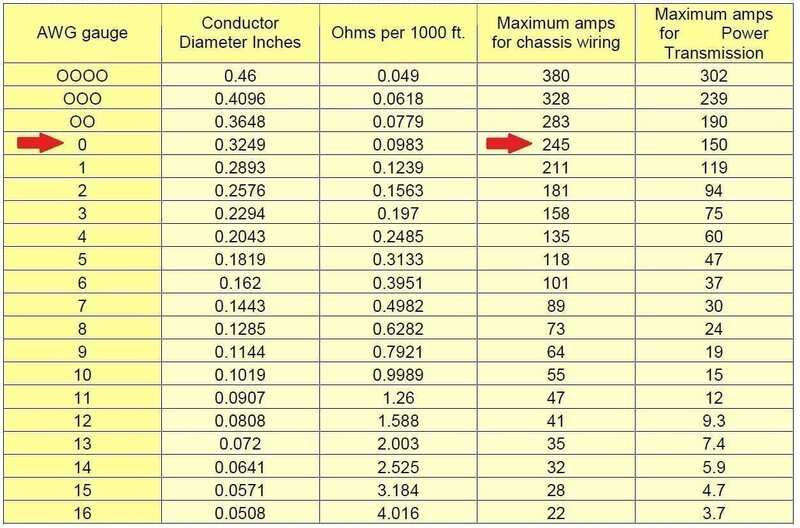 In our example we can see that 1/0 AWG cable would be appropriate (#1 AWG has a maximum rating of 211A, which is fairly close to our maximum amperage, so it would be a good idea to go up in size to the next gauge especially for lengths over 10 feet). *** PLEASE NOTE: For distances over 10 feet, voltage drop over the cables will occur due to resistance through the wiring. If you will need to run cables longer than 10 feet, it is recommended that you increase the cable size in order to compensate for voltage loss. If you are unsure about your application feel free to give us a call and we will be able to assist you in finding the right cable. How do I know the Watt or Amp rating of my appliance? Figuring out the Watt or Amp rating for an appliance or piece of equipment can be found somewhere on the equipment or you can use this estimator found online by clicking here. Once you have your Watt or Amp rating, total all equipment and then follow these guidelines. An inverter needs to supply two needs – Peak or surge power, and the typical or usual power. Surge is the maximum power that the inverter can supply, usually for only a short time (usually no longer than a second unless specified in the inverter’s specifications). Some appliances, particularly those with electric motors, need a much higher start up surge than they do when running. Pumps, compressors, air conditioners are the most common example-another common one is freezers and refrigerators (compressors). You want to select an inverter with a continuous rating that will handle the surge rating of your appliance so you don’t prematurely burn out the inverter. Don’t rely on the inverters surge to start your equipment because inverters don’t like to operate in their surge mode unless the manufacturer claims to have a longer surge time than normal. Typical is what the inverter has to supply on a steady basis. This is the continuous rating. This is usually much lower than the surge. For example, this would be what a refrigerator pulls after the first few seconds it takes for the motor to start up, or what it takes to run the microwave – or what all loads combined will total up to. (see our note about appliance power and/or name tag ratings at the end of this section). What inverter should I use in my RV? I need power that doesn’t keep the campground up at night! Does this sound familiar? You can have power and not run the generator by using an AIMS DC to AC power inverter. Most RVs come with a converter. Don’t mistake a converter with an inverter. A converter converts 120 VAC electricity into 12 VDC. 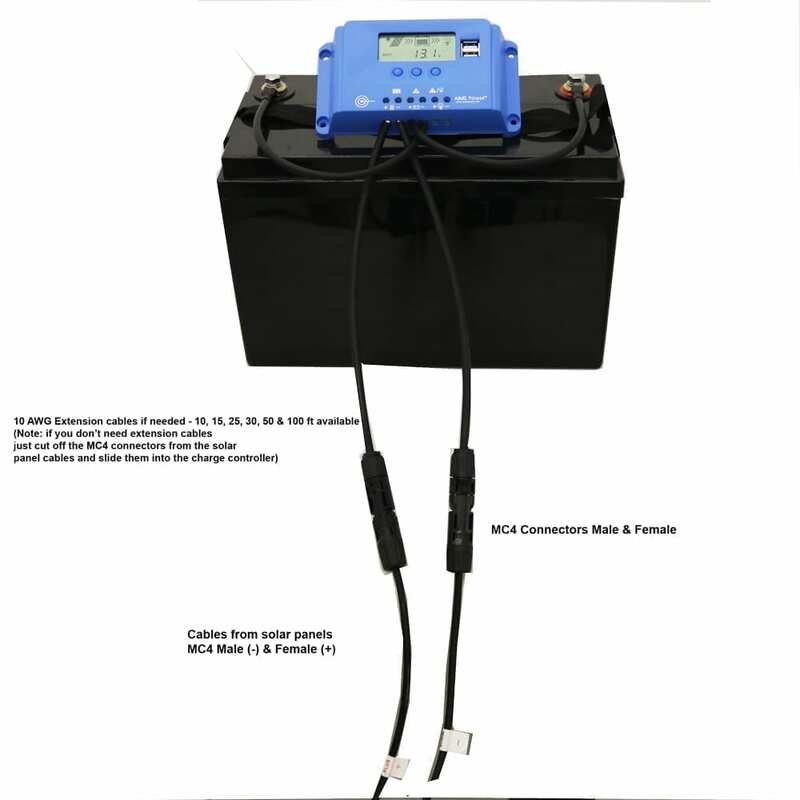 The converter charges your batteries and powers lights, pumps, and all of the 12 volt equipment. The RV’s inverter converts 12 VDC from your battery into 120 VAC, standard house electricity. In order to buy the “right” inverter for your RV, you’ll need to determine the size of the inverter. To decide what size you need, total the wattage requirements of all the equipment you want to power, and then add another 20%. Next you’ll need to decide if you need a pure sine or modified sine inverter. Most pure sine inverters will power any type of device. Modified sine inverters are better for pumps, motor, tools or equipment that has a DC brick power supply (from experience Macintosh products excluded). Microwaves are temperamental and we recommend using a pure sine. Click here to get wattage appliance estimates. Pumps, compressors, heaters, microwaves and some tools have high surge requirements to get them started so make sure you include these in your calculation (3x-5x surge in most cases). You want to use the surge rating of all the equipment to size your inverter. Buy an inverter that has a continuous rating that matches the surge total of all equipment and then add another 20%. Example: Total appliances running at the same time including the surge is 3600 watts but the running watts are only 2000 watts. You would get an inverter that is 3600 *1.20 = 4320 watts. Obviously, we don’t have a 4320 watt inverter so we would recommend a 5000 watt. Your continuous running amp draw is 2000 watts/12DC = 166DC amps. Note this number for the next section. You also want to determine if you have enough battery power available. Using the example above, you don’t want to install a 5,000 watt inverter if the 166DC amps needed to supply it will run down your batteries in 30 minutes. To estimate your anticipated power consumption, take the current (from the example above) 166 DC amps and multiply by the number of hours per day that you expect to use it. Let’s say you will run 2000 watts, 166 DC amps for a total of 2 hours per day. You will need 166*2 hours= 332 amps total. You will also want to check the efficiency of the RV inverter that you are selecting. Because the process of converting from 12 VDC to 120 VAC generates heat, the inverter will always draw more watts from the batteries than it can deliver. Some brands have greater losses than others (usually 8-10%). If you have a battery bank of 400 amps, you will be able to run your 2000 watts for 1.2 hours but we don’t recommend fully depleting your battery bank. Take your total available battery amps of 400 and divide by your total amp need of 332 and you get 1.2 hours. 400/332= 1.2 amp hours. We recommend no less than 50 depth of discharge. If you follow this recommendation you will get 1.2 hours * .50% = .6 hours of run time. We offer many inverters that have built in transfer switches that allow you to go back and forth between shore and inverter power. Our inverter chargers allow you to use the inverter with city or generator power to recharge the batteries/bypass when you have access to AC. Some have cooling fans, remote switches and add breakers for safety. Some also have direct connect terminal blocks to tie into a panel. Please call us if you you need more info about RV inverters. What is an ETL listed inverter? Our ETL listed models that conform to UL 458 or UL1741 and CSA 22.2 have a few internal components that are different from our non UL models. These components have been recommended by the ETL lab and are required to pass ETL certification equivalent to UL 458 / UL 1741 standards. The ETL listed models have also gone through more rigorous testing and offer a two year warranty. How long can I run my equipment with battery and inverter? What equipment can I use with an inverter? In general most equipment or devices that you use at home or a commercial job can be used with an inverter but check with your equipment manufacturer. Audio Equipment Some top-of-the-line audio gear is protected by SCRs or Triacs. These devices are installed to guard against power line spikes, surges, and trash (nasties which don’t happen on inverter systems). However, they see the sharp corners on modified sine wave as trash and will sometimes commit electrical hara-kiri to prevent that nasty power from reaching the delicate innards. Some are even smart enough to refuse to eat any of that ill-shaped power, and will not power up. The only sure cure for this (other than more tolerant equipment) is a digital or pure sine wave inverter. Computers Computers run happily on modified sine wave but better on pure sines. The first thing the computer does with the incoming AC power is to run it through an internal power supply. We’ve had a few reports of the power supply being just a bit noisier on modified sine, but no real problems. Running your prize family-heirloom computer off an inverter will not be a problem. What can be a problem is large start-up power surges. If your computer is running off the same household inverter as the water pump, power tools, and microwave, you’re going to have trouble. When a large motor, like a skill saw, is starting, it will momentarily pull the AC system voltage way down. This can cause computer crashes. The fix is a small, separate inverter that only runs your computer system. It can be connected to the same household battery pack, and have a dedicated outlet or two. Ceiling Fans Most variable-speed ceiling fans will buzz on modified sine wave current. They work fine, but the noise is annoying. Invest in a pure sine. Radio Frequency Interference All inverters broadcast radio static when operating. Most of this interference is on the AM radio band. Do not plug your radio into the inverter and expect to listen to the ball game; you’ll have to use a battery powered radio and be some distance away from the inverter. This is occasionally a problem with TV interference when inexpensive TVs and smaller inexpensive inverters are used together. Distance helps. Put the TV (and the antenna) at least 15 feet from the inverter. Twisting the inverter input cables may also limit their broadcast power (strange as it sounds, it works). Phantom Loads and Vampires A phantom load isn’t something that lurks in your basement with a half-mask, but it’s close kin. Many modern appliances remain partially on when they appear to be turned off. That’s a phantom load. Any appliance that can be powered up with a button on a remote control must remain partially on and listening to receive the “on” signal. Most TVs and audio gear these days are phantom loads. Anything with a clock—amplifiers, coffee makers, microwave ovens, or bedside radio-clocks—uses a small amount of power all the time. Medical Equipment Customers frequently ask us about the use of inverters for medical equipment. Unless specifically noted in the regulatory approvals for the product, assume that no AIMS inverter has regulatory approval for use with medical devices or life support equipment. If you use a AIMS Power Inc. inverters with a medical device it’s at your own risk. We recommend only using pure sine inverters. How do I hook up the inverter to my battery(s)? You will need cables. Each inverter requires a negative and positive cable. We recommend the maximum length of 15 feet. If your application requires longer than 15 foot cables, we advise increasing the cable size (awg). To find out what size of cable is needed for you inverter, click on the inverter and click on the ‘Add Cables’ section. You can also use the following formula to calculate the max amps per inverter: Inverter wattage / inverter DC voltage = DC amps (2000 watt inverter \ 12 volt DC = 166.6 DC amps). Using this example, our 1/0 AWG cable is adequate for this application because the 1/0 AWG is rated up to 284 amps. This cable will be able to handle the required amps of 166.6 up to 20 feet because the max current of the cable far exceeds the required 166.6 amps. What is the difference between modified, pure sine wave inverters? There are 3 major types of inverters – pure sine wave (or “true” sine wave), modified sine wave (actually a modified square wave), and square wave. Pure Sine Wave A pure sine wave is what you get from your local utility company and from some pure sine generators (most generators are not pure sine). major advantage of a pure sine wave inverter is that all of the equipment which is sold on the market is designed for a pure sine wave. This guarantees that the equipment will work to its full specifications. Some appliances, such as motors and microwave ovens will only produce full output with pure sine wave power. A few appliances, such as bread makers, light dimmers, and some battery chargers require a pure sine wave to work at all. audio equipment, satellite systems, and video equipment, will run properly using pure sine wave inverters. these are the most expensive of the inverter designs and outperform all other types of inverters, regardless of use. Analog Pure Sine Wave The sine wave produced by an analog pure sine wave inverter, is very similar to that of the digital pure sine wave inverter. The key difference is that the analog switching causes noise or static on the ac wave. generally most appliances, motors, microwaves, chargers, and power tools will produce full power and not cause any buzzing or negative effects. these types of pure sine inverters are not recommended for medical equipment unless manufacturer approved. Modified Sine Wave (quasi-sine) A modified sine wave inverter actually has a waveform more like a square wave, but with an extra step. A modified sine wave inverter will work fine with most equipment, although the efficiency or power of the equipment will be reduced with some. Motors, such as refrigerator motor, pumps, fans etc will use more power from the inverter due to lower efficiency. Most motors will use about 20% more power. This is because a fair percentage of a modified sine wave is higher frequencies – that is, not 60 Hz – so the motors cannot use it. Appliances with electronic timers and/or digital clocks will often not operate correctly. Many appliances get their timing from the peak of the line power – basically, the modified sine has a flat top rather than a peak – this may cause the occasional double trigger. Because the modified sine wave is noisier and rougher than a pure sine wave, clocks and timers may run faster or not work at all. Items such as bread makers and light dimmers may not work at all – in many cases appliances that use electronic temperature controls will not control. The most common is on such things as variable speed drills will only have two speeds – on and off. most equipment will operate without any noticeable difference, and because the lower cost, makes this the most common inverter sold and generally the only type found at your local retailer. Square Wave Very few but the very cheapest inverters any more are square wave. A square wave inverter will run simple things like tools with universal motors with no problem – but not much else. These are seldom seen any more except in the very cheap or very old ones. Of course we don’t sell these. Too cheap! Second, select an inverter. 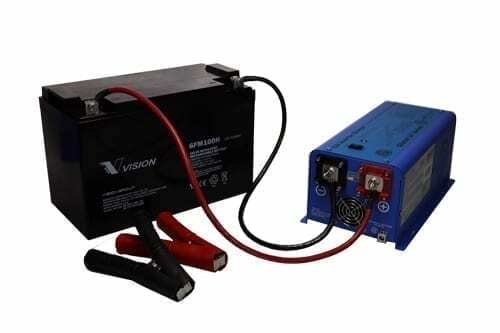 For this example, you will need a power inverter capable of handling 4500 watts. The continuous power requirement is actually 2250 but when sizing an inverter you have to plan for the start up so the inverter can handle it. Third, you need to decide how long you want to run 2250 watts. Let’s say you would like to power these items for an 8 hour period. Well this can be tricky because heaters and fridges run intermittently. Let’s assume all of the appliances will run 40% of the 8 hr period which is 3.2 hours of actual run time. We need to convert the ac watts to dc amp hours because that’s how batteries are rated. To convert ac watts to dc amps per hour you divide the watts by the DC voltage (usually 12v or 24volts). 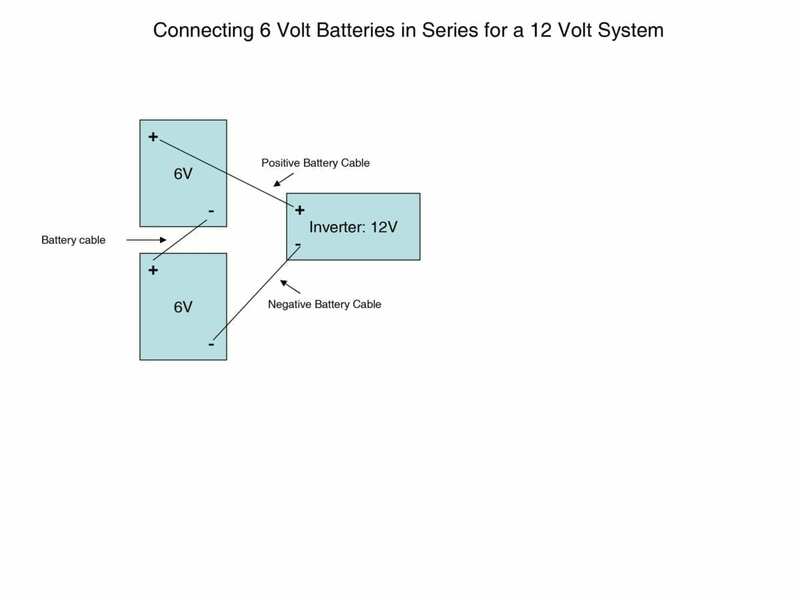 Let’s use 12volts since it is the most common. You have now determined that 187.50 is your power requirement per hour and now you need to multiply that by total hours of run time which is 3.2 in our example. Because you are using an inverter, you want to calculate the loss for converting the power which is usually around 5%. Fourth, now that you know your total power requirement is 630 dc amps we can select a battery source. 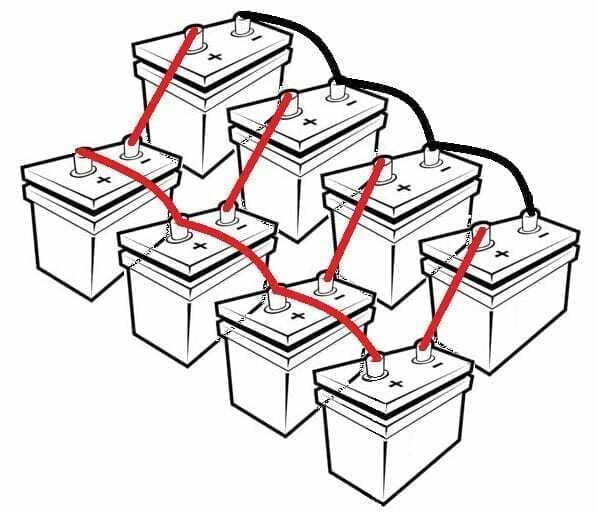 Most typical deep cycle batteries are 6 volts or 12 volts. I will give you two examples using each voltage. 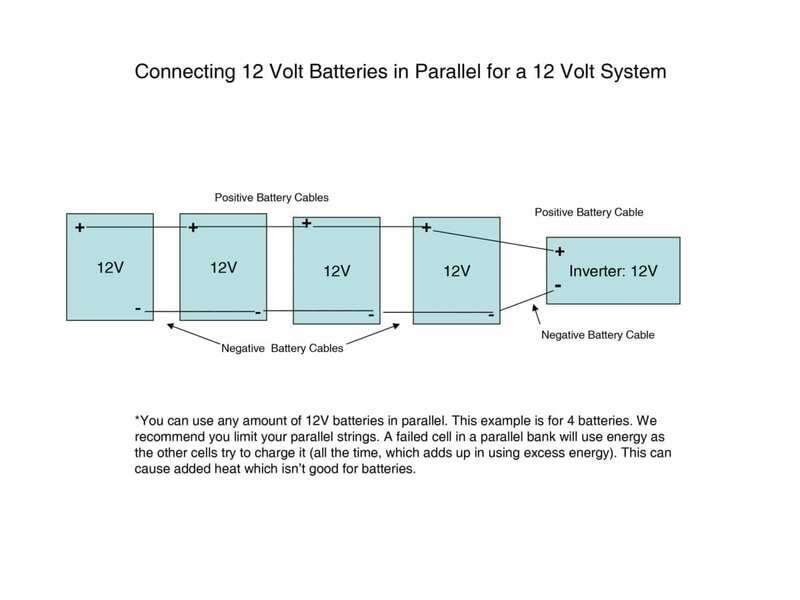 12 volt battery example: If you select a 12 volt battery rated at 100 dc amps you will need 6 or 7 batteries in parallel (I will explain parallel vs. series later). 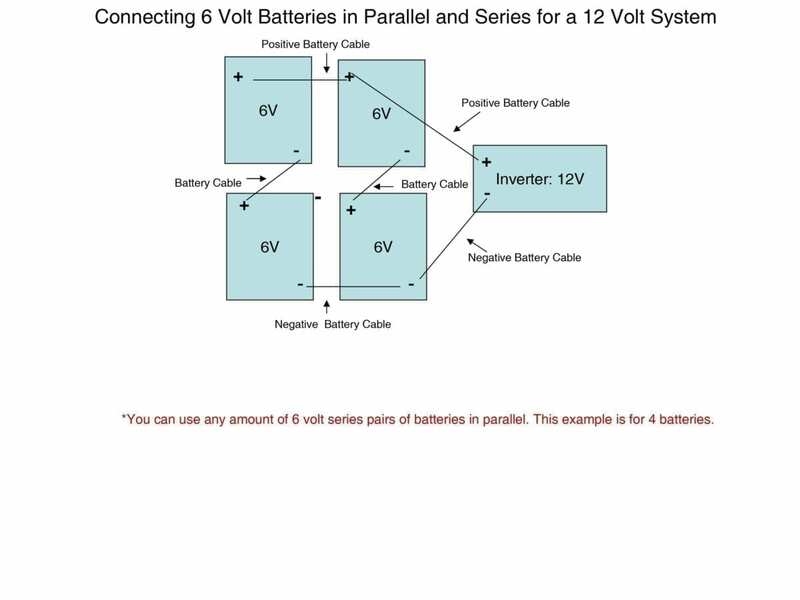 6 volt battery example: If you select a 6 volt battery rated at 200 dc amps you will need 6 batteries in series and parallel. 3.15 * 2 = 6.3 batteries No, I didn’t make a mistake. When you use 6 volt batteries, you have to connect them in series to reach 12 volts. Then you connect each series pair of 6 volts in parallel to create your 12 volt battery bank. What is series and parallel you ask? When you connect batteries is parallel you are increasing amps. When you connect batteries in series you increase voltage. In the battery world, it is better to limit your parallel strings. It is better for your power system. In this example, I would recommend using 6 volt batteries because of the number of batteries this example requires. How do we charge these batteries? You will need a charger to charge the batteries when you have access to city power. Most deep cycle batteries need a “smart” charger so the charger doesn’t damage the batteries. In this example, you will need at least a 40 amp charger if not bigger. The bigger the charger, the faster the charge. Make sure your charger is for 12 volt batteries because the system we just identified is a 12 volt system. You will also need cables. For this example, a 4 AWT (0000) cable is required to handle 4500 watts of start up power. That is huge cable. You may also want to consider an inline fuse. A 500 amp for this example is perfect. To figure out the size of fuse you divide your ac watts (start up) by dc voltage. You would need a 375 amp fuse or bigger. I recommend a 500 amp just incase you were to max out the 5000 watt inverter. This is just a brief example. There are many different ways to set up your system. You can use solar panels, wind etc. Can I keep my 1/2 horsepower sump pump running during a tropical storm or hurricane? You can use the AIMS 3000 watt inverter charger with built in transfer switch to power your sump pump during a power outage. Along with the inverter, you will need a battery bank to power the sump pump when the AC power is unavailable in an outage. The sump pump needs backup power to keep your basement dry during a hurricane. The amount of emergency power you have available will depend on the size of your battery bank, as well as how often your sump pump cycles on and off. We recommend you use deep cycle marine batteries to build your battery bank. Generally, 1 or 2 AGM sealed lead acid 100 amp hour batteries would be the minimum you would want to use. In terms of backup power, you will never have too much power. In a big storm, like Hurricane Harvey & Irma, people were without power for many days in some heavily populated areas. Having extra emergency backup power will prevent serious damage to your home during a hurricane or tropical storm. The inverter will need to be connected to the battery bank using 1/0 AWG UL listed cables. Theinverterstore.com recommends always using a inline fuse kit within 12 inches of the battery bank on the positive terminal to prevent a battery fire caused by a ground fault. When the AC power goes out, this inverter/charger will automatically switch over to run off the batteries. Eliminating the need to wake up in the middle of the night and start your noisy generator. How do I run my sump pump during a power outage? You can use a power inverter to power your sump pump during a power outage. Sump pumps vary in size. The most common that our customers call us to power are 1/3 horsepower sump pumps, and 1/2 horsepower sump pumps. The best option we have here at theinverterstore.com would be our inverter/charger with built in transfer switch. From our experience, 1/3 hp sump pumps and below can be ran with our AIMS Power 1500 watt power inverter with charger and built-in transfer switch. For higher capacity pumps like a 1/2 hp sump pump you should use AIMS Power 3000 watt power inverter with charger and built-in transfer switch. The sump pump is first connected to the power inverter. The inverter is connected to both your battery bank and city power. As an added benefit to this, the incoming AC power will charge and maintain the battery(s) for you. The sump pump is run off of AC power directly through the power inverter/charger. When AC power is lost the inverter will automatically transfer to the battery bank. An automatic sump pump back up system, like the one offered by theinverterstore.com, gives the customer piece of mind. Back up sump pump systems ensure that the pump will have constant power supply whether you are home or away. As you already know hurricanes, tropical storms and other heavy rain can deliver a lot of water to your sump. Investing in an inverter/charger with transfer switch is better than repairing a basement from flood damage during a hurricane or heavy storm. How do I connect the charge controller to the battery? You will need a negative and positive cable to connect the charge controller to the battery. The cable size is determined by the size of the charge controller. We recommend using high quality, certified cable with high quality lugs and shrink tubing. Our cables are UL listed and extra flexible and made for inverter applications. Here is a guide for sizing your cable. Note this is recommended for the AIMS Power cable. The AIMS cables have high quality copper and braided differently, which have higher current ratings. NOT all cable is made the same. AIMS Power does not offer 12 or 16 AWG cable. You can always use 10 AWG as a substitute. It’s ok to go with bigger wire. We have partnered with Paypal Credit to offer financing. Simply add the products to the shopping cart, click Paypal as the payment option and follow the prompts to apply for financing with Paypal Credit. For more info about Paypal Credit click here. Yes. A taxpayer may claim a credit of 30% of qualified expenditures for a system that serves a dwelling unit located in the United States that is owned and used as a residence by the taxpayer. Why spend the money on a lithium battery? **Depth of Discharge (DoD) is used to describe the % of the battery’s energy that has been discharged. For example, if the battery is charged 100%, its DoD is 0%. If the battery is 100% discharged, the DoD is 100%. If the battery’s DoD is 40%, it still has 60% of its energy. It is another way of stating the battery’s state of charge. GEL/AGM battery manufactures recommend a % of DoD to prolong overall battery life. What is the difference between 12, 24 and 48 Volt DC systems? When entering into the off-grid and renewable energy industry, one of the first questions that will need to be answered is “what capacity and voltage configuration do I need for my battery bank?”. 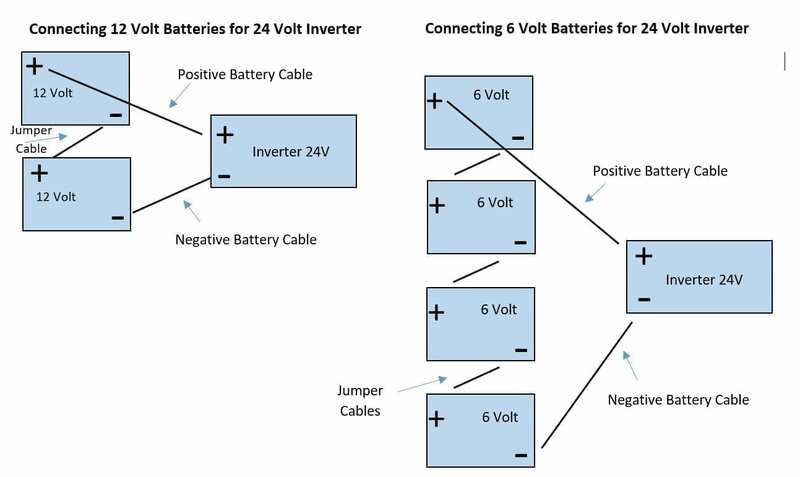 Most inverters will fall into 3 categories for their input requirements: 12VDC, 24VDC, and 48VDC. This is referring to the nominal DC voltage that the inverter will invert to AC voltage (i.e. 120VAC or 240VAC). **Though there are multiple other AC supply voltages and configurations, we will be generally referring 120VAC as it is the most widely available. Ohms law tells us that Power is the product of Voltage and Current in a given circuit (Watts = Volts*Amps). With this, we can use some basic algebra to work out exactly what nominal voltage we should be using for your system. First, I would like to breakdown this formula into portions relative to our conversation. Watts, or power, should be calculated based on the actual power ratings for the electronic devices you wish to power using an inverter. Usually, this number will be located on the power cord or the nameplate of the device. Once you have these numbers you will want to add together the values for any devices that would be powered at the same time, this will be the number you use to pick the size of inverter you will need (e.g. if you had a 50W fan, 250W TV, and 200W DVD player that would be running at the same time, you would need at least a 500W inverter). Once you have calculated your total wattage need, you will want to pick a nominal voltage for your battery bank. This can be done arbitrarily at first to simply check what the amperage would be in different configurations or based on external variables such as only having one battery available. Regardless, once you have the power and voltage values, we can then move on to calculating the amperage which by proxy will tell us how large our conductors should be and the ratings for components such as fuses, breakers, lugs and the composition thereof. By decreasing the amount of amperage in the DC circuit, there will be a wider range of products such as cables and fuses, available for your specific configuration. How many batteries do I need for my inverter? To size a battery bank we take the hours needed continuously x watts = total watts/DC volts=amps needed. Example: 3 hours of run time needed * 1500 watts = 4500 watts total / 12 volts DC = 375 amps. You will need a total of 375 amps of stored power in the batteries. We don’t recommend fully depleting your batteries so keep this in mind when you are calculating the number of batteries needed. Here is another example: Let’s say you purchase a 2000 watt inverter 12 Volt. If you max out the inverter at 2000 watts, you are pulling 2000 watts /12 volts = 166.6 DC amps per hour. If you use a 200 amp 12 volt battery you would divide 200 amp battery / 166.6 amps = 1.2 hours of run time. This is if you plan on fully depleting the battery, which we DON’T recommend. We recommend 50% depth of discharge. Since we recommend 50% depth of discharge, you would divide 1.2 hours /50% = .60 hours. If you use 30% depth of discharge you divide 1.2 hours/30%=.36 hours. How do I connect my batteries for a 24 Volt system? How do I connect multiple 6 Volt batteries in series and parallel for a 12 Volt system? How do I connect my 6 Volt batteries for a 12 Volt system in series? How do I connect my 12 Volt batteries in parallel?